Bichon Frise Dogs are Delightful! Bichons are a bouncy and perky breed. They have such a happy-go-lucky demeanor that they are loved by everyone, including strangers, family, owners, kids and even other pets. Bichon Frise dogs can also be described as affectionate and sensitive. At Furry Babies, we always have Bichon Frise dogs for sale. Take a look in our available puppies gallery. Most dogs are playful, we get it, but Bichon Frise dogs take it another level and beat them all in this department! They’re a wonderful addition to any family and thankfully they are kid-friendly. In fact, they are one of the top small dogs that are also kid-friendly. The Bichon’s average weight ranges from 8 to 12 pounds and they are slightly longer than they are tall. They also have an average lifespan of 12 to 15 years. 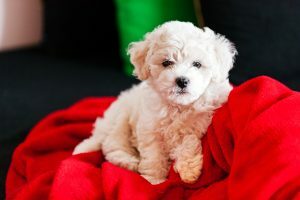 The Bichon’s name means “curly coated,” in French. To maintain their fluffy coats, you will need to brush and groom your dog daily. They require considerable time for the maintenance of their luxurious coats. They need grooming, bathing and trimming on a regular basis to keep them from getting matted. You’ll see that an adult Bichon Frise dogs have an entirely white coat, but as a puppy, they are born in gray, apricot, or butter shades. They eventually grow to the bright white coats that they sport as adult dogs. Say what? Bichon Frise dogs are born toothless, deaf, and blind. The pups do not fully open their eyes until they are at least 12 days old! They are easy to train when it comes to tricks and commands. You’ll find that they love to please and respond well to positive reinforcement and treats. However, they need patience and consistency with training. These beautiful puppies are really intelligent and highly sociable. They will suffer from separation anxiety if left alone for too long. They need regular exercise especially to burn off all of their playful energies!